The Blue Grass Chemical Agent-Destruction Pilot Plant (BGCAPP) will safely destroy a chemical weapons stockpile that comprises more than 500 tons of chemical agent in weapons stored at the Blue Grass Army Depot. The main plant will remove both explosive components (energetics) and chemical agents from the nerve agent munitions and neutralize them in separate processes. These processes involve equipment specifically designed and extensively engineered and tested for this use. This computer graphic illustrates the main components of the Energetics Batch Hydrolyzer system. The EBH system consists of large, rotating drums similar to cement mixers, along with robots, tanks and pumps. The system will use robots to transfer hoppers containing sheared rocket warheads into the rotating drums. The drum will be filled with water and caustic, munitions parts will be placed inside, and the EBH will rotate and mix for two to three hours while the drum’s temperature is maintained at approximately 240 degrees Fahrenheit. When processing is complete, the solids and liquids will be separated. The solids will be collected in a waste tray and transferred onto a conveyor for processing in the Metal Parts Treater. The liquid, known as energetics hydrolysate (caustic wastewater), will be collected and pumped to the Energetics Neutralization Reactors for further processing. 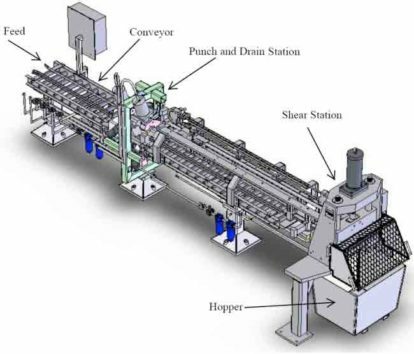 This computer graphic of the Metal Parts Treater highlights the main components of this process equipment system. The Metal Parts Treater (MPT) will be used to thermally decontaminate metal projectile bodies after the chemical agent has been drained. This will involve heating the projectile bodies to 1,000 degrees Fahrenheit for 15 minutes. The device will also be used to decontaminate secondary wastes such as wood, rags, protective clothing, plastics and other materials that may have been exposed to agent during plant operations. Projectile bodies, with the chemical agent removed, will be placed on trays and transferred through an airlock into the MPT on conveyors. The same conveyor system will be used for secondary wastes. In the MPT main chamber, the tray will be heated by electrical induction. This treatment will be performed in an oxygen-limited atmosphere to prevent combustion. Once the process in the MPT main chamber is complete, the tray will be transferred to the outlet airlock and then to a cooling chamber. After the projectile bodies have cooled, they will be removed from the plant and recycled. The remnants of secondary wastes will be packaged in drums and sent to a permitted disposal facility. The Munitions Washout System (MWS) will remove agent from projectiles by remotely accessing the cavity that contains chemical agent and allowing it to drain. Once projectiles are in the MWS, a robotic arm will hold the projectile upside down in a device known as the Cavity Access Machine. A hydraulically powered ram will be inserted into the burster well (a tube in the middle of the projectile) and will crush the burster well to access the chemical agent. Agent will be drained from the projectile and transferred for further processing. The metal projectile bodies will then be placed on trays and transferred, via a conveyor to the MPT, where they will be heated to ensure that any residual agent has been removed. 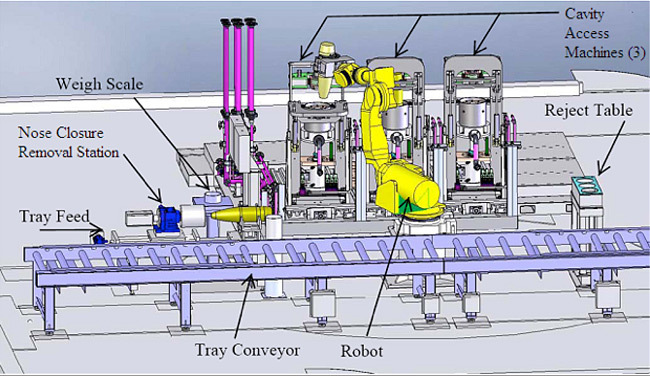 This computer graphic of the Munitions Washout System highlights major system components and shows projectiles being processed through the system. 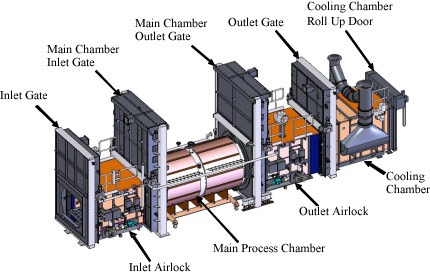 This computer graphic illustrates the main components of the Rocket Shear Machine and the path, from left to right, a rocket will move through the system. Two pieces of remotely operated equipment—the Rocket Cutting Machine (RCM) and the Rocket Shear Machine (RSM)—will remove energetics and agent from the rockets. Part of the Blue Grass stockpile consists of M55 rockets containing either GB or VX nerve agent. The M55 rockets are approximately six feet long and six inches in diameter, and are packaged inside a fiberglass shipping and firing tube. The rocket consists of two sections, a motor that propels the rocket and a warhead that contains chemical agent. In the RCM, the rocket will be grasped by a device similar to the chuck in a power drill, and a machine much like a plumber’s pipe cutter will make two cuts. The first cut will go through the shipping and firing tube, and the second will go through the threads connecting the motor and the warhead. This will separate the rocket into two components – the warhead and the motor (still inside the shipping and firing tube). The motor and shipping and firing tube will then be transferred for further processing, while the warhead will go to the RSM. The RSM will punch holes in the warhead and drain the agent. The chemical agent will be transferred for further processing. Once the agent has been removed, the warhead is then cut into four pieces, which will be transferred to the Energetics Batch Hydrolyzer for further processing. 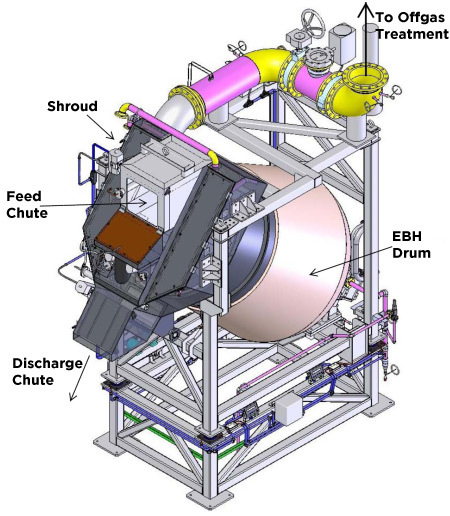 This computer graphic of the Rocket Cutter Machine illustrates the main components of the system and shows a rocket being processed through the system.